"On the surface, anime has several 'tried-and-true' characteristics that fans fondly mock by putting together things like 'The Laws of Japanese Animation'. The similarities across different shows-and even different genres-are part of what give anime its distinctive feel that makes it different from most other animation. Our goal from the beginning was to make a game that lived up to the overall look and style of the genre as closely as possible, but Shogo, like the series and films that inspired it, isn't just about giant robots... Anime often tends to be epic in scope, but it almost always explores its larger issues through the smaller, more personal focus of its chief characters... Shogo plunges you into an epic crisis the outcome of which will affect the future of the entire human race, but it is the characters who drive the narrative and motivate your actions... Simultaneously, we give you 10 meter tall anthropomorphic Mobile Combat Armor, devastating weapons of destruction, and all the visual flair a discerning anime fan would hope for." This article lists elements and concepts from Shogo Mobile Armour Division that does not fit into any other category. "At first glance, Cronus (technically 46CronusD, the fourth planet in the nearly dead Cronus system) seems like an unlikely place to play such a critical role in the future of humanity. It is a hostile, barren world with a poisonous atmosphere, incessant volcanic and seismic activity, and an unexceptional collection of minerals easily mined from hundreds of thousands of more accessible asteroids and moons, not to mention the handful of human-colonized worlds. However, when a deep space probe sent to the system to collect scientific data for cataloging purposes detected chemically compelling organic material in soil samples, the United Corporate Authority (UCA) was formed by three dominant megacorporations (Andra Biomechanics, Armacham Technology Corporation, and Shogo Industries) and a jointly funded manned expedition was launched. That early venture found rich deposits of the organic material, dubbed kato for the probe that discovered it (the Shogo DSP Katoki). It would be over a decade before the benefits of kato energy would become apparent and interstellar travel would change forever..."
The planet 46CronusD is the fourth planet in the nearly dead Cronus system. It is the where the precious ore kato is to be found, and this is what lead to it to be colonized despite its harsh surface level environments that are unsustainable for long-term human excursion. Instead the planet's three permanent human colonies are built in subterranean caves where water can be found. "Cronus, a semi-hostile terrestrial class K planet, is only partially suitable for human colonization. While many underground caverns contain ice, and in some cases liquid water, extreme surface temperatures prevent human colonization above the subterranean level. Cronus averages 45 degree Celsius during daylight hours, with a thin atmosphere of mostly nitrogen and trace amounts of ammonia gas, oxygen and water vapour present in most areas, the surface is not suitable for long term unsupported excursions." "What makes kato especially enticing and useful is its unique chemical composition. Being of an organic nature, kato at first seemed comparable to petroleum-a vestigial remnant of ancient indigenous life. On further examination, however, it was discovered that kato is actually alive in some sense, although no more sentient than algae. The importance of kato derives from its reaction to high temperatures. When burned, kato passes through several stages of recomposition before losing its volatility. Each of these stages produces an impressive amount of energy, but it's what happens at the subatomic level that proves the most beneficial. In the course of its chemical breakdown, kato emits a tachyon field that can be harnessed to allow an object (such as a vehicle) contained within the field to tunnel (i.e. move from one place to another without passing through each increment of space in between), thereby travelling at superluminal speeds. Space travel without kato energy would be like walking from New York to Los Angeles versus flying there in a Concorde. As you can imagine, interplanetary travel without kato energy is entirely impractical." The precious ore that is used to power star ship drives. It is what lead the mega corporations to build mining colonies on the planet Cronus where it is to be found. It is also used in a personal weapon and a giant star gun called the Kato Cannon that can cause major damage to planets and ships. It is revealed that Kato is created by the giant underground creature called Cothineal. In the 20th anniversary live stream, it is mentioned that the original name of the element was "bioridium". "The importance of kato derives from its reaction to high temperatures, when burned kato passes through several stages of re-composition before losing its volatility. Each of these stages produces an impressive amount of energy, but it's what happens at the sub-atomic level that proves the most beneficial. In the course of its chemical breakdown, kato emits a tachyon field that can be harnessed to allow an object, such as a vehicle, contained within the field to tunnel through space-time, thereby travelling at superluminal speeds." "The population of Cronus grew steadily and rapidly, even when the first underground colony, Avernus, was devastated by a series of powerful earthquakes that led to a mass migration to the burgeoning city of Maritropa. Avernus, although abandoned, continued an eerie quasi-life of its own, for its geothermal energy supply still pumped life through the city, powering streetlamps, heating ducts, atmospheric processors, hydroponic farms, and condensation collectors. Those few who had chosen to remain behind were able to sustain themselves with a minimal amount of maintenance and repair." An underground city and the first major colony on Cronus. After an earthquake most of the inhabitants evacuated to Maritropa. However the city maintained a life of its own as ecological phenomena supplied electricity to the cities systems. The Fallen later used Avernus as a base of operations, nearby Gabriel's own headquarters. "The first Cronian colony, Avernus, was founded a mere fifteen years after the Shogo deep space probe Katoki discovered the substance we know as kato. Avernus would eventually grow to support a population of nearly five hundred thousand scientists, engineers, corporate personnel, and civilians. By that time, two other cities had been founded: Constantine in the southern hemisphere, and Maritropa to the north. When steadily increasing seismic activity finally necessitated the permanent evacuation of Avernus, Maritropa absorbed most of the refugees and became the new capital." A former installation of the C.M.C that is accessible through the Madison Tunnel, it was overran by the Fallen and can be used as an entrance into their headquarters. The headquarters of the Fallen is a huge fortress in the mountains outside of Avernus. Sanjuro has break into it and fight to free his brother from the avatar of "Gabriel" in the second ending. A research station in Avernus that contain proof of Cothineal's existence. Kura and Sanjuro extracted the information and uploaded it to the Leviathan, despite Shogo troopers seizing the station. A dilapidated history museum located in Avernus in which Sanjuro meets up with Toshiro; in it he decides whether or not to destroy the Fallen or stop the kato cannon. If he decides the latter he escapes unscathed, otherwise he has to fight his way out against Fallen troops. "Maritropa, unlike its ailing sister city, was intended from its incorporation to be a sparkling metropolis that afforded all the accustomed luxuries of other, comparatively vital colony worlds to its diverse inhabitants. The vast, snaking reinforced cavern system that housed Maritropa flourished with greenery, artificial light, and cosmopolitan life. For all its self-imposed glory, Maritropa wasn't the utopia it pretended to be, though. The lower sectors of the city eventually began to fall into disrepair as the aristocracy moved to the Canopy Section, a series of buildings suspended from the cavern ceiling. Using a material called Stion™ (developed by Armacham) which becomes highly tensile when charged with an electrical current, engineers devised a support structure with a tremendous load-bearing capacity. The view from the slums affords an ironic perspective of the hierarchical structure of Maritropan society." Another major city on Cronus. It became more populated after the Averenus earthquakes. The city has a strong class division, leading to large slums. A nightclub in the Maritropan slums where Sanjuro and Kura had agreed to met. In the end Sanjuro reaches it too late, as Kura had been captured by the CMC. The current headquarters of the CMC, Sanjuro has to blast through it to get to it's detention centre and free Kura before Fallen Assassins kill her. Another colony on Cronus in the southern hemisphere, that is mentioned in passing as also under the risk of the kato cannon from the Leviathan. The main command ship orbiting Cronus, the UCASF Leviathan is the flagship of the UCA and is commanded by Admiral Akkaraju. During the events of the game the Admiral eventually takes military control of the ship after disobeying the orders of UCA High Command. In the second ending Sanjuro boards the ship and he and Kathryn (who was locked up) infiltrate the ship, while in the first the ship is attacked by a squadron of Ikari Fighters sent by Shogo Industries, although Kathryn assures Sanjuro that they can fight them off. A shuttle of the Leviathan that is responsible for landing UCASF troops onto Cronus, it is piloted by Captain Evans. 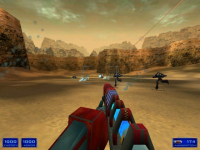 It is responsible for the emergency evacuation at the beginning of the game as well as dropping Sanjuro off at landing zone LZ Minotaur on the planet's surface at the start of his mission to assassinate Gabriel. "Shogo has been most heavily influenced by a more narrow cross-section of anime: mostly that concentrating on mecha. The influence of Robotech, Patlabor, and the more recent Neon Genesis Evangelion can be found in Shogo, not to mention non-mecha science fiction anime such as Ghost in the Shell and Venus Wars." This section is to list the various references to outside media within Shogo, for homages to Shogo present in later Monolith products or elsewhere see Shogo: MAD#Future and Legacy. The influence of Robotech, Patlabor, Appleseed, the various Gundam series, and the more recent Neon Genesis Evangelion anime series can be found in Shogo. Shogo has a reference to Blood. On magazine stands there is a magazine with Caleb shown on the cover, accompanied by kanji alongisde English reading "Who is Caleb? ", and the Fallen also occasionally speak intelligible cultist. There is also reference to another Monolith property in the form of a Captain Claw doll. You can even squeeze it to make it say "Magic Claw!". The level names "High and Low" and "The Hidden Fortress" homage film titles (released 1963 and 1958 respectively) by famed Japanese live-action director Akira Kurosawa. The surnames of the Makabe brothers are also taken from Kurosawa, with his long time collaborator Toshiro Mifune playing Kuwabatake Sanjuro in Yojimbo (1961) and Sanjuro Tsubaki in its successor Sanjuro (1962). The substance Kato shares the name of Satori Kato, a chemist who was one of the first to develop instant coffee (after David Strang of Invercargill, New Zealand in 1890). Working in Chicago in 1901, Kato introduced the powdered substance in Buffalo, New York at the Pan-American Exposition. This was the same event that saw the assassination of U.S. President William McKinley. Several of the names of the officers in the room's next to Sanjuro's are taken from various animes and mangas, including R. Hunter from Robotech, N. Izumi and A. Shinohara from Patlabor, M. Kusanagi from Ghost in the Shell, and I. Dyson (who's room can be entered if attempted three times) from Macross Plus. 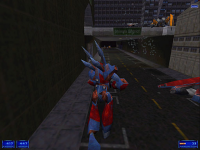 The game shares several sound effects in common with the acclaimed 1995 anime film Ghost in the Shell directed by Mamoru Oshii (the probable namesake for the Oshii Research Station), as well as featuring a similar urban look within Maritropa, and the spider-like Uhlan in Shogo being particularly reminiscent of the Fuchikoma/Tachikomas from the franchise. Masamune Shirow's other manga Appleseed features similar spider drone designs, and the 1988 OVA features mecha designs and urban backdrops very similar to Shogo. There is also a sign for Aramaki Freight, a likely reference to the character Daisuke Aramaki from Ghost in the Shell. Kathryn makes reference to the Leviathan being attacked by "Ikari" fighters just before Sanjuro attacks Cothineal in the first ending. The surname of "Ikari" is notably given to the characters of Shinji Ikari, Gendo Ikari and Yui Ikari in Neon Genesis Evangelion. 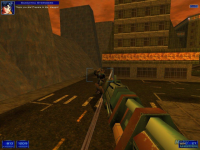 There is also a deathmatch map entitled "OF_Ikari". 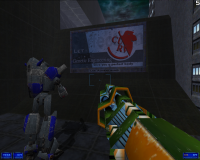 In addition, one of the signs in the game parodies the NERV logo by presenting it as CURV, a firm specializing in genetic engineering, an image which is also seen on posters, one of which can be found in Sanjuro's quarters in the second level. The energy shielding projected onto Gabriel by Cothineal is also not dissimilar to an A.T. Field, and the M.C.A. melee weapons are similar to the progressive knives used by the Evangelions. Another billboard features an advertisement for a "Kawasuki" motorbike that looks like the ones in the influential 1988 anime film Akira. Yet another billboard makes reference to the store "Silky Doll Lingerie" from Bubblegum Crisis. The War Angel posters and billboards are references to Battle Angel. Two similar items reference Transformers, a sign for the Megatron bank and a poster promoting the Deseptikons band. Shogo deep space probe Katoki is named for Hajime Katoki, a mecha designer for the Gundam series; the substance kato is in-universe named for the probe. One of the broadcasts from the Radio Free Cronus station put out by the CMC mention the demise of the idoru Miyu Makarana after a cyber-attack, referencing the concept of virtual pop stars from William Gibson's 1997 novel Idoru. Another also makes reference to a stock market rise after a software giant called Microorganism declared chapter eleven bankruptcy; a possible jibe about the development history of LithTech. The voice acting in the game, ridiculed as corny by some, mirrors the state of early English dubs of anime.